1. Bad odors – As your septic tank gets fuller and fuller, odor-causing gases may emanate from your drains, toilets, and drain field area. If something smells less than pleasant, this may be your septic system telling you it needs attention. 2. Slow drains – Do your drains, tubs, showers, and toilets suddenly drain slower than usual? This is a good indication that your septic tank needs a good pumping. 3. A lush, green lawn – Even though this sounds like a good thing, you don’t want the grass over your drain field to be greener and healthier than the rest of your lawn. If your drain field grass looks different, this is a sign it’s receiving too much “fertilizer” from your septic tank. 4. Sewage backups – If you ignore the need for septic pumping and some of the telltale signs that it’s time, ending up with a sewage backup in your home is a very real and unfortunate possibility. 5. Standing water—When your septic tank gets full, water may start to pool up in different places on your property. In many cases, excess water will show up around your drain field and around the septic tank itself. 6. Excess nitrate content in well water – If your home relies on well water, wastewater could leach into your drinking water and create higher-than-normal nitrate levels if your septic system requires pumping. 7. 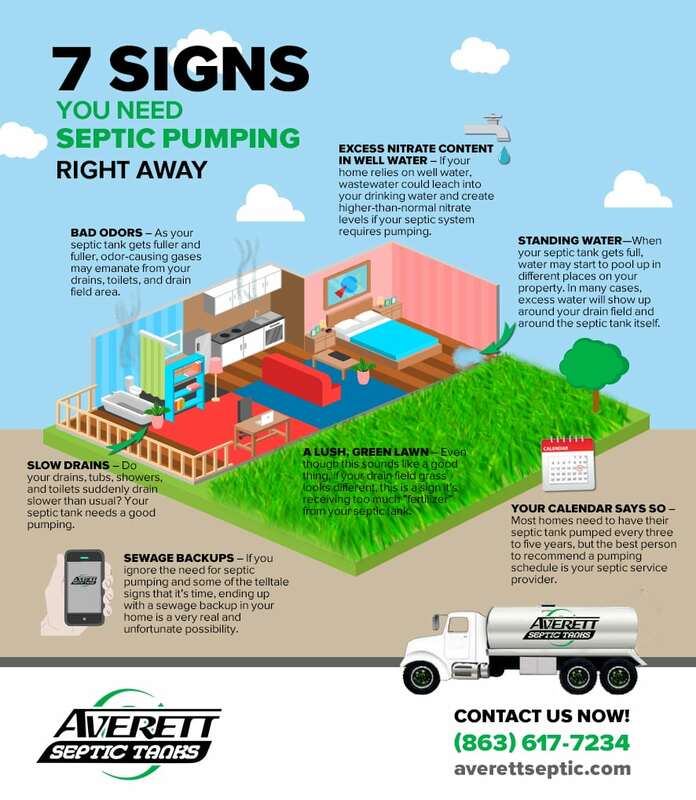 Your calendar says so – The best time to schedule septic pumping is according to schedule. Most homes need to have their septic tank pumped every three to five years, but the best person to recommend a pumping schedule is your septic service provider.